James “Skinny” Sheahan calls himself an Irish thoroughbred. Sheahan, who has held positions as executive director of the City of Chicago Mayor’s Office of Special Events, chief external relations officer for the Metropolitan Pier and Exposition Authority and served as a Chicago Public School Teacher, is only half-joking. There is pride in his voice as he tells how his father emigrated from County Limerick in Ireland, and how both of his mother’s parents came from the Old Country. Sheahan, who grew up in a family of eight kids in his Southwest Side neighborhood, still lives there today. His passion, not only ties to his neighborhood, but for the City of Chicago is part of how the Skinny and Houli Show is truly a voice of Chicago. 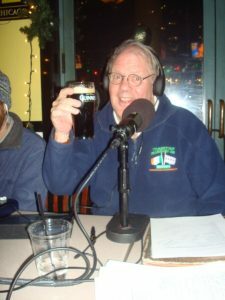 Tuning into the Show is like embarking on a Chicago excursion as listeners become part of the extended family of this South Side Irish team.